Aims and Objectives: When compared to five-membered N-heterocyclic carbene, recent reports have demonstrated that ring expanded NHCs showed rather different properties such as increased basicity (nucleophilicity) and greater steric demand. These unique features provide an opportunity to design new chiral ligands. This study was undertaken to design and synthesize a series of novel enantiopure pyrimidone salts, the precursors of N-heterocyclic carbenes, and their activity in asymmetric diethylzinc addition of arylaldehydes was demonstrated as well. Material and Method: Commercially available dimethylmalonic acid was treated with thionyl chloride to form dimethylmalony dichloride, followed by subsequent reaction with different chiral primary amine produced corresponding diamide. Next, conversion of diamide to monoamide was achieved by partial reduction with lithium aluminum hydride. Finally, cyclization of monoamide with triethyl orthoformate in the presence of ammonium salts provided pyrimidone salts in good yields. Results: Seven enantiopure pyrimidone salts, the precursors of N-heterocyclic carbenes, have been synthesized starting from dimethylmalonic acid. 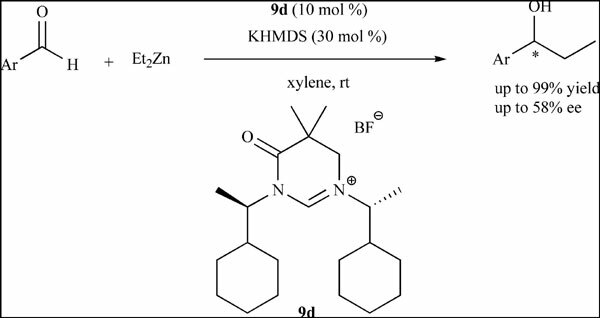 Their applicability in asymmetric diethylzinc addition of arylaldehydes has been demonstrated and the corresponding secondary alcohol was obtained with good yields and moderate enantioselectivities. Conclusion: Herein we developed an efficient route to prepare a series of novel N-heterocyclic carbene precursors, which were demonstrated as effective catalysts for asymmetric diethylzinc addition of arylaldehydes, and the corresponding secondary alcohol was obtained with good yields and moderate enantioselectivities. Keywords: N-heterocyclic carbene, pyrimidone salt, Et2Zn, asymmetric addition, enantioselectivity, chiral secondary alcohols. Keywords:N-heterocyclic carbene, pyrimidone salt, Et2Zn, asymmetric addition, enantioselectivity, chiral secondary alcohols. Abstract:Aims and Objectives: When compared to five-membered N-heterocyclic carbene, recent reports have demonstrated that ring expanded NHCs showed rather different properties such as increased basicity (nucleophilicity) and greater steric demand. These unique features provide an opportunity to design new chiral ligands. This study was undertaken to design and synthesize a series of novel enantiopure pyrimidone salts, the precursors of N-heterocyclic carbenes, and their activity in asymmetric diethylzinc addition of arylaldehydes was demonstrated as well.